A perfect cocktail for a celebration or party. Cut 4 thin slices of lime and orange in half and reserve. Squeeze the juice from 2 limes, divide evenly between 8 champagne flutes. 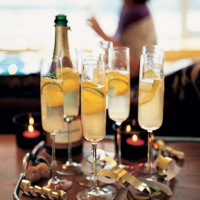 Add a pinch of caster sugar and 2 tsp Cointreau or Grand Marnier to each glass, stir, add the lime and orange slices, and an ice cube, then top each with chilled Waitrose Brut Non Vintage Champagne. Have the lime and liqueur base ready and waiting in glasses on a tray, ready for topping up with ice and champagne.